It took me a wile t get them in stock but they are finally hear. The best and last clam rake you will ever perches. They have an all stainless steel head and a sturdy wood handle the teeth are knife blades and go thro the sand like butter saving you back and arms. We have 2 sizes in stock and have already sold a couple since they come in this morning. Took my first day off in a wile and decided to head out fishing with a coupe of buddies. And the fishing was hot we had a 4 man limit of sea bass several of witch where jumbos mostly taken of the jig with Gulp! on the high hook. We also landed a mess of ling a couple of flounder and two Tog. The one I’m holding was 9 pounds 1 ounce. I was using a light wait G-Loomis rod a Quantum Boca 40 filled with 20 pound Power and it was a battle to get him to the top. Even stranger was it bit on a jig a 3 ounce green and gold Jigfish from Got-Cha. The best fishing is in deep water so go out and have some funn…. 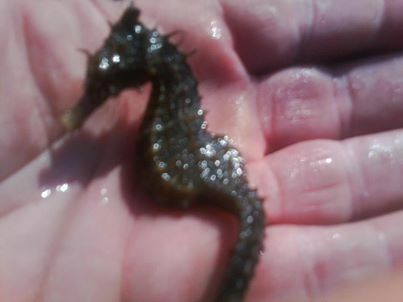 Captain Fred Pane found and let go this amazing pregnant seahorse the other day in the bay behind Sea Isle City. There are amazing things to find, see and do all around this Beautiful Island you just need to get out and do it….